Acupuncture comes from traditional Chinese medicine, which dates over 2000 years and increasingly in Western medicine since the 1970’s. It is used to treat a wide range of common health problems and to reduce pain and inflammation. It is based upon the holistic concept of treatment and the body’s ability to return to its balanced state of health. It takes into account the body is a self-repairing mechanism and any inference should be aimed at encouraging this self-healing ability. Acupuncture can be combined with other Physiotherapy treatments such as exercise, manual therapy and relaxation techniques. It can also be used when other more conventional treatments have failed. Anaesthesia (numbness) is initiated by the stimulation of a small group of nerves in the muscle around the needles. This sends impulses to the spinal cord, leading to activation of chemical production by the brain and spinal cord. The chemicals (endorphins, mono-amines and ACTH) are then released into the bloodstream. They block the pain impulses, help with relaxation and also have anti-inflammatory effects. These effects increase with successive treatments. 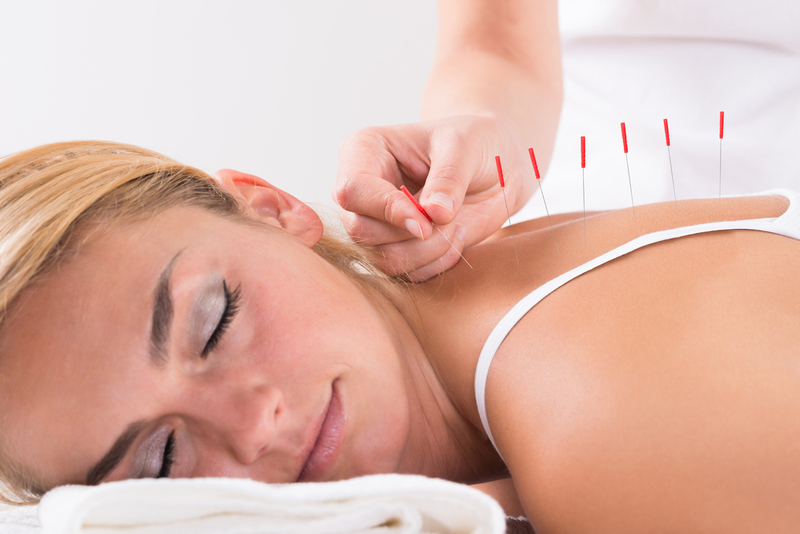 Acupuncture can also be used to reduce the sensitivity of tender points in the body. Trigger point Acupuncture may also be used to facilitate relaxation in specific muscles following trauma such as whiplash injury, for chronic un-resolving muscle pain such as repetitive strain injury (RSI) or as a means to obtain increased muscle length in order to aid stretch and rehabilitation such as sports injuries . Here the needle is placed into the affected muscle until it is felt to relax under the needle and then removed. Trigger point needling is often much quicker and therefore does not require the 20 minute treatment time. An involuntary muscle “twitch” is often felt by patients receiving this type of acupuncture. Acupressure uses the Physiotherapist’s hands over Acupuncture or trigger points in order to relieve muscle tightness. It is a healing art that uses pressure on the key Acupuncture points. The amount of pressure used varies according to the condition and requires trained, sensitive hands. It is often used with sensitive patients, patients with a needle phobia , children or frail patients. Acupuncture is safe when practised by a member of the Acupuncture Association of Chartered Physiotherapists (AACP) because of the strict hygiene guidelines that must be adhered to, and the training courses and educational updates that are required in order to stay on the membership register. This in addition to a three year study as a physiotherapist and at least one year clinical practice. Licensing is also required by the local council to ensure that strict hygiene standards are adhered to. Acupuncture needles are the same width as human hair, and are much smaller than an injection needle, so having acupuncture does NOT feel the same as having an injection. The needles are disposable, pre-sterilised and individually packaged. These are often supplied in guide-tubes for easy insertion which means that there is no risk of anything touching the needle during the process. When needles are inserted, you may feel a temporary, sharp pricking sensation. The overall number of treatment sessions required will depend on you, your condition and your physiotherapist’s assessment. Most patients receive a course of four to six treatments although just one or two treatments may be enough. Treatments are normally given at weekly intervals. It is generally clear after a few sessions whether or not acupuncture will benefit you and if the treatment should be continued. The effects of acupuncture treatments are cumulative: different people respond in different ways and at different rates. Some people may feel an immediate relief of their symptoms whilst others may only see a gradual improvement after a few treatments. Some people may find that their condition/symptoms flare up for up to 24 hours after the treatment but then see an improvement. Although acupuncture can help reduce pain, particularly when other more conventional treatments have failed, it does not work for everyone. What local areas do you serve for Acupuncture? Back2Fitness Physiotherapy has served clients all over the West Midlands. We actively serve Birmingham and Wolverhampton acupuncture services. Sports massage is beneficial for anybody experiencing aches, pains and injuries. Manual Therapy or manipulative therapy improves mobility in areas that are restricted.